Also on the programme piece by Adam Basanta, Frederick Gran and Philippe Leroux! More info on the programme, HERE! ​Interesting introduction to my work these days from WEISSLICH series where I had a pleasure of performing back in April, 2016. Immaculate Machine of Liveness premiered by Ensemble Apparat at St. Paul's in Huddersfield as part of CeReNeM visiting artist concert! I have finished editing my Master's Thesis which was presented last March at the Conservatorium van Amsterdam's research symposium. Here I talk about how performances with gestural controllers and sensors today have not come to significantly diversify the standard instrumental practice with live electronics. I discuss the history and evolution towards gestural performances while looking at the composers of the American avant-garde in the 1950s and 1960s as well as the developments in Amsterdam’s STEIM centre for electro acoustic instrumental research from early 1980s to present time. I also discuss my own setup with flute and a MINIBEE accelerometer and highlight other artists who work with a similar setup. I would like to acknowledge the generous support of Canada Council for the Arts for my studies and research in 2014-15 at the Conservatorium van Amsterdam. Short-Wave Apocalypse is Solomiya Moroz's final graduation Master's recital and an interdisciplinary collaboration immersing the audience in the themes of the whimsical, surreal and apocalyptic as realised through music, dance, video and live electronics. Three musicians and one dancer share the music and movement together on stage, when one movement becomes a sound sculpture and brings sound to the next gesture. From shifting landscapes to changing soundscapes, the hypnotic sound sequence is almost always present like the time that is ticking away, ignorant of a constant moving state of emergency that is just around the corner. Are we in it? Are we experiencing it? Can you grasp it or is it already gone? Since I have started my 2nd year of Master's at the Conservatorium of Amsterdam with intensified research into gestural controllers and inter-desciplinarity I decided to start a blog where I will post about my new findings, perhaps inciting other people to contribute through comments as to my research. Coming soon - watch out for blog entries on this site! I have started a Master's in Live Electronics at the Conservatorium of Amsterdam this year where I have been learning live electronic softwares like Max MSP, SuperCollider, STEIM's new LISA and JunXIon as well as performance with them. I have been busy with this no doubt, recently I had an opportunity to present some of my new music at SOTU festival, here is a short semi-improvised piece called Pleiades from the festival. Creation Residency at Espai Erre in Barcelona with a contemporary dance group Les Filles Föllen this past April and May working on a creation of the original concept for music score and sound design to a multi-disciplinary show "La Fatigue" to be premiered in Montreal at the Zone Homa Festival on August 21, 2013. Our specific project Keys, Wind and Strings is part of soundSCAPE festival in Maccagno, Italy this July as an ensemble in residence. Four new works will be written for us and presented at the end of the festival. I am also a featured composer participant at the festival, writing a solo work with electronics for virtuoso clarinetist Gleb Kanasevich. Sept personnes jouent avec la danse, la physicalité et la connexion avec la musique et la vidéo. Jusqu’à ce qu’ils réalisent que le bonheur ne les conduit pas partout, et ils veulent plus. Le poids du corps et la fatigue de le porter au fil du temps valent la peine de perdre la stabilité, la sécurité et de marcher dans des lieux inconnus. Ils représentent la légèreté et la frivolité dans le mouvement du corps et interagissent avec le public qui lui, fait partie intégrante du spectacle. In January and February of 2013, I will be joining Toronto's Thin Edge New Music Collective and guest artist German accordionist, Olivia Steimel for a Canadian concert tour entitled: Keys, Wind and Strings – sonic explorations for accordion, flute, piano and violin. 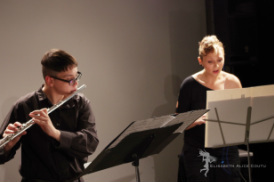 The primary focus of this project will be the premiering and dissemination of two new works by emerging Canadian composers Anna Pidgorna and myself written for this unique instrumentation. We are honoured to have been accepted for an artistic residency at the Banff Centre with Olivia where we will spend two weeks in preparation for the tour which will take us to Calgary, Vancouver, Victoria, Toronto and Montreal and will include performances at Calgary’s Happening Festival of Music and Media alongside renowned ensembles such as grammy nominated eighth blackbird and Calgary’s own Land’s End. Several concerts on the tour will also feature interesting collaborations with local musicians including a performance with guitarist/composer Jeff Younger at Vancouver’s 1067, while the Montreal concert will be co-presented with bass-saxophonist/composer Jason Sharp. This tour was made possible through the generous support of the Canada Council of the Arts as well as the Shevchenko Foundation. standing still, a video and sound installation, examines Griffintown’s current social condition in the midst of rapid urban redevelopment. While informed by Italo Calvino’s book Invisible Cities, the piece navigates through a neighborhood-in-transition to explore issues of identity, themes of solitude, desire, memory, displacement and abandonment. By way of collected sounds and images, the artists re-imagine Griffintown’s emerging identity while looking at dissipating urban structures and historic sites. pour explorer les questions d’identité ainsi que les thèmes de la solitude et de l’abandon. Cette troisième édition de la série de concerts Bruissements du Cercle rend hommage à l’illustre compositeur américain d’avant-garde, John Cage (1912-1992). Accordant souvent une place de choix à l’électroacoustique, aux philosophies orientales, au hasard ou aux instruments modifiés/inhabituels, l’oeuvre de John Cage a révolutionné les conceptions traditionnelles de son milieu musical et laissé un héritage toujours aussi riche aujourd’hui, 100 ans après sa naissance. Les co-directeurs de l’événement, Gabriel Dharmoo (voix) et Solomiya Moroz (flûte), partageront la scène avec Diego Espinosa(percussion), James O’Callaghan (électroniques) et Katelyn Clark (piano-jouet) pour interpréter différentes oeuvres de John Cage, dont Water Walk, Aria + Fontana Mix et Suite for Toy Piano, ainsi qu’une composition de Solomiya Moroz (Toy Memory). Pour ponctuer le programme, l’artiste de performance et d’art corporel Michelle Lacombe réinterprètera différentes performances de Fluxus, mouvement artistique né dans les années 60, se réclamant de l’héritage de John Cage. 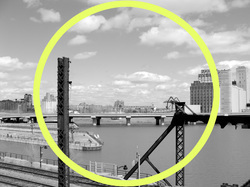 Griffintown Polyphony presents field recordings from Griffintown neighborhood located in the South West of Montreal. Once a booming industrial area occupied by Irish settlers in the middle of 19th century, today the district is undergoing a controversial redevelopment, to become a modern condo and office-area with little respect for its former history, architecture and present cultural life. The recordings include elements from Griffintown's industrial past and daily activities—trains, silos, horse carriages and bike paths—as well as from the current construction sites. As shown in the map on display, the field recordings are from both the district's east and west sides. 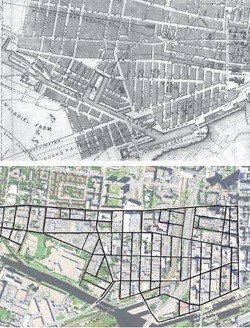 It is important to know that the cultural life of Griffintown is threatened by the development project that aims to segregate completely its East from its West. Review of Bruissements du Cercle !! 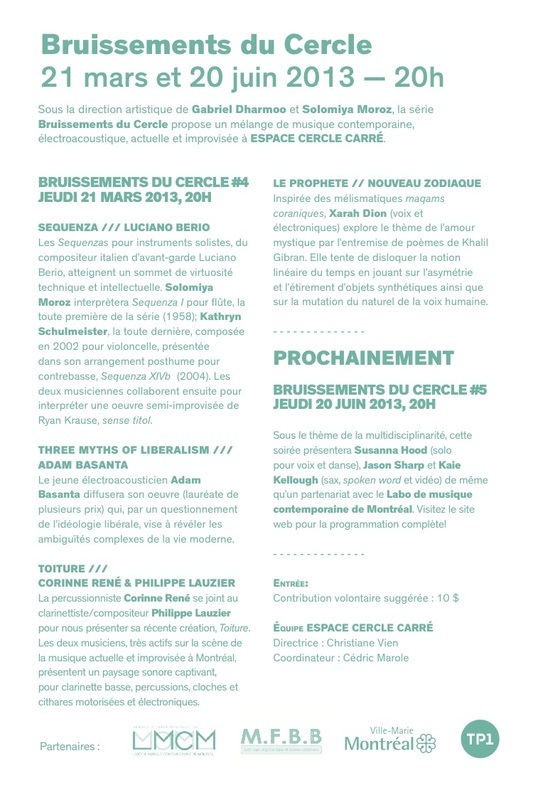 Co-dirigée par Gabriel Dharmoo et Solomiya Moroz, la série de concerts Bruissements du Cercle propose un heureux mélange de musique contemporaine, électroacoustique et improvisée à ESPACE CERCLE CARRÉ. Ces soirées réunissent des musiciens de divers horizons, médiums et esthétiques mais avec l’objectif commun de présenter du répertoire novateur et stimulant. 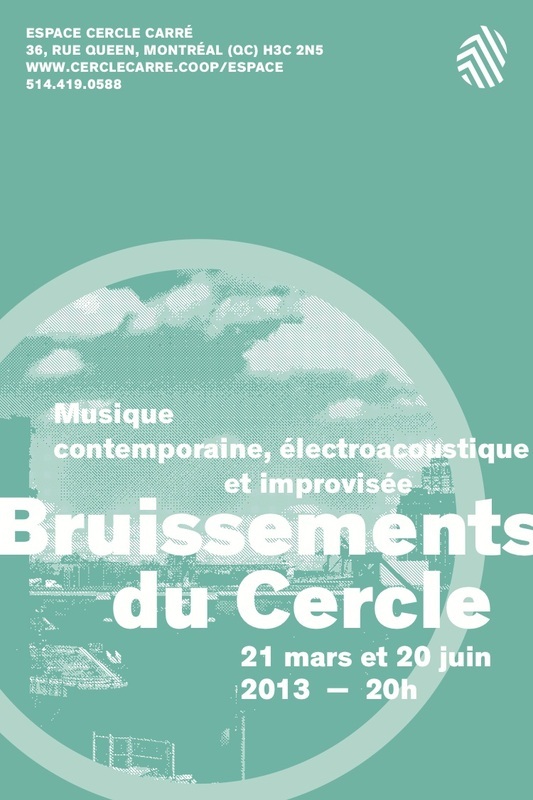 Co-directed by Gabriel Dharmoo and Solomiya Moroz, concert series Bruissements du Cercle proposes a mix of contemporary, electroacoustic and improvised music at Espace Cercle Carré. The concerts bring togethers musicians from diverse backgrounds, media and aesthetics with a common goal to present new and stimulating music. Starting January 16 I will be in residency at the Banff Centre in the Canadian Rockies primarily focusing on composition as well as preparing for Cluster New Music and Integrated Arts Festival in Winnipeg March (8-10). I will spend seven weeks working in a beautiful and unique Leighton Artists Colony studio, this residency programme was made possible through CALQ Artists Studios programme in collaboration with the Banff Centre. I am also happy to announce that starting in April I will be working with Eva Furrer, the flautist of Klangforum Wien in Vienna, Austria. My lessons and stay in Vienna are supported through a development grant from Conseil des Arts et Lettres du Québec. Going to Boston on December 12th to rehearse our new repertoire by Taylor Brook who had recently finished his piece for us, L'erotisme sacré as well as pieces by Jacob Sudol, Olga Neuwirth and Zosha di Castri all to be given Canadian premiers March 8-10, 2012 during Winnipeg's adventurous Cluster New Music and Integrated Arts Festival. Also putting together a fresh new programme of original works, improvisations and graphic scores for toy piano, flute/piccolo and electronics to be presented at the Open Sound series in Greater Boston on December 17th. Not to be missed if you are in the area! Just a little note to let you know of the events that marked this summer musically for me. It seems like New York was on my mind a lot! I spent 12 days in June playing in New York and collaborating with various great musicians. In particular: Dominic Lash, Valerie Kuehne, Karl Berger, David Grollman, and Lucio Menegon. I also had a pleasure of playing with the musicians of Yolt when they came through Montreal on their Eastern tour: Nathaniel Morgan, Weston Minissali and David Grollman. I had a great experience in collaborating with an old friend and great bandurist Julian Kytasty when I came back to New York at the end of August. Thus many exciting new musical meetings and performance took place and I am looking forward to posting some sound samples in due time and to future collaborations with these fine folks! (I do believe there is a cabaret-performance with some New York cats planned for October 24 at Casa del Popolo, so stay tuned!) Meanwhile, please enjoy the duo with Nathaniel Morgan recorded at l'envers! Gabriel Dharmoo et Solomiya Moroz proposent un programme éclectique de musique contemporaine, électroacoustique et improvisée à l'Espace Cercle Carré. Ce projet pilote réunit des improvisateurs et musiciens interprétant l’oeuvre de compositeurs émergeant et établis. Prochainement, les co-directeurs envisagent une série de concerts où des musiciens de divers horizons, moyens d'expression, médiums et esthétiques pourront présenter du répertoire novateur et stimulant à l’Espace Cercle Carré. Gabriel Dharmoo and Solomiya Moroz propose a programme of eclectic contemporary, electroacoustic and improvised music at Espace Cercle Carré. This pilot concert brings together musicians improvising or performing compositions by emerging and established composers. In the future, the co-directors envision a concert series where musicians from diverse backgrounds, means of expression, media and aesthetics can present new and challenging works at Espace Cercle Carré. Electric Noise is going to Gaudeamus Interpreters Competition, April 10-17 ! Paysages éphémères est une performance, fruit d’une collaboration entre musiciens, danseurs et vidéastes. S’inspirant du livre d’Italo Calvino, Les villes invisibles, et plus précisément de cinq de ses villes, Valdrada, Eudoxia, Leonia, Melania et Olinda. Paysages éphémères en créé une nouvelle, celle-ci, bien qu’imaginaire, nous renvoie à notre propre ville. Paysages éphémères est issue d’une collaboration entre Solomiya MOROZ (composition musicale et direction artistique), Julien-Robert LEGAULT SAVAIL (conception vidéo), Marc Genya ST-ARNAUD / Melina STINSON (chorégraphie et mise-en scène) et Maxime BOISVERT(photographie). Le spectacle, par la musique, la vidéo et la danse, fusionnera les 5 villes en une seule vision, laissant une grande place à l’improvisation. Avec la participation de Adam Basanta – ordinateur (traitements en direct et électronique), Jonah Fortune – contrebasse, Adam Kinner - saxophone, Krista Martynes – clarinette basse, Solomiya Moroz – flûte, Tony Spina – percussion, Ingrid Wissink – violon ; et danseurs: Melusine de Maillé, Melina Stinson, Mellisha Dow et Miriah Brennan. Le 6 et 7 décembre, ce collectif se produira à la Fonderie Darling, lieu idéal pour découvrir cette étonnante production multidisciplinaire. Paysages éphémères is based on the book by Italo Calvino's Invisible Cities, and it is centered on five cities from the book: Valdrada, Eudoxia, Leonia, Melania and Olinda. The purpose of this collaboration between various musicians, dancers, and video/photo artists is to create an imaginary city inspired by five selected cities that could remind audiences of their own city. Paysages Ephémères is collaboration between Solomiya MOROZ (direction and music composition), Julien-Robert LEGAULT SAVAIL (live video) and Marc Genya ST-ARNAUD/Melina STINSON (choreography) and Maxime BOISVERT (photography). The details and descriptions of five cities are meticulously interwoven into a multi-media and multi-disciplinary dance, music and video production with improvisations contributing to the interactivity of the performance. With participation of Adam Basanta - computer (electronics), Jonah Fortune - bass, Adam Kinner - tenor saxophone, Krista Martynes - bass clarinet, Solomiya Moroz - flute, Tony Spina - drums, Ingrid Wissink - violin, and dancers: Melusine de Maille, Melina Stinson, Marc-Genya St.Arnaud, Mellisha Dow and Miriah Brennan. On the 6th and 7th of December, the group will perform at the Darling Foundry, and this will be a perfect opportunity to experience their multi-media and multi-disciplinary production. We have 30 days to fundraise $1000 to ensure that our project will happen December 6, 7 at the Darling Foundry in Montreal. Please help by clicking on the link below!! You can also help by spreading the word through Twiter, Facebook, email. Anything counts. Thank you!!! 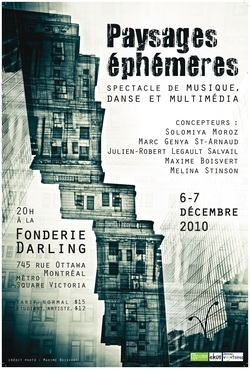 Performance-installation in the stairwell of Artist Coop Cercle Carré, 36 Queen Street, Montreal. Performance entitled Dialogue was performed with cellist/composer Gabriel Dharmoo where I used live audio processing while playing the flute. Spacial circulation between floors was encoraged for the audience to gain a different perspective on the acoustics of the stairwell as well as musicians positioning was changed between performances (three presentations of 20 minutes). The event was well attended with other happenings at Espace Cercle Carré: vernisage, projections of short films, projections of members' auto-portraits. I have had the honor to be accepted to this year’s Music Omi International Musician Residency where I had the chance to collaborate with diverse high-caliber musicians and artists from around the world. It was a unique research and creation residency as the participants were called on to interact with other musicians/composers in order to create new works and performance projects. I collaborated with eleven other fellows from around the world including Austria, France, Iceland, India, Korea, Mexico, USA, and the UK. Music Omi generously sponsored each fellow’s room and board during the stay at the residency near Hudson Valley, in Ghent, New York. 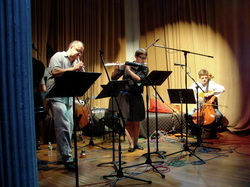 The residency culminated with a performance at the Art Omi, Ghent, New York campus on August 7, and in New York City at The Roulette venue on August 9.